Due to recent media coverage, I’ve received many inquiries on the Waverley West Arterial Roads Project. This update should clarify some inaccurate information that people are receiving. The Waverley West Arterial Roads (Kenaston Boulevard and Waverley Street) are designated City of Winnipeg ‘regional roads’ and part of the City of Winnipeg’s Regional Street Network. In 2015, the Waverley West Arterial roads handled an average of 7,500 to 15,000 vehicles/ weekday daily traffic. Kenaston Boulevard is a key route to the City of Winnipeg’s only active landfill. Over 100,000 vehicles access the landfill via the Perimeter Highway and Kenaston. Management at Brady did not have readily available data regarding the number of commercial vehicles accessing the landfill. Identified in the City of Winnipeg’s Master Transportation Plan and approved by Winnipeg City Council in 2011, the Waverley West Arterial roads are a critical link in the Strategic Goods Movement Network. 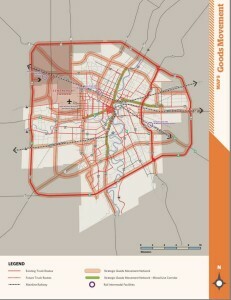 They “ensure an effective and sustainable goods movement network that includes key trade corridors and truck routes as part of the balanced, multi-modal transportation system.” The connection of Kenaston Boulevard to the Perimeter Highway enables in- bound goods movement around and through the City of Winnipeg (click on map to increase size). Kenaston Boulevard connects to the south Perimeter Highway to enable a future north-south linkage to the U.S Border. The Province of Manitoba acquired land to construct a cloverleaf in future which will then link to the St. Norbert By-Pass. 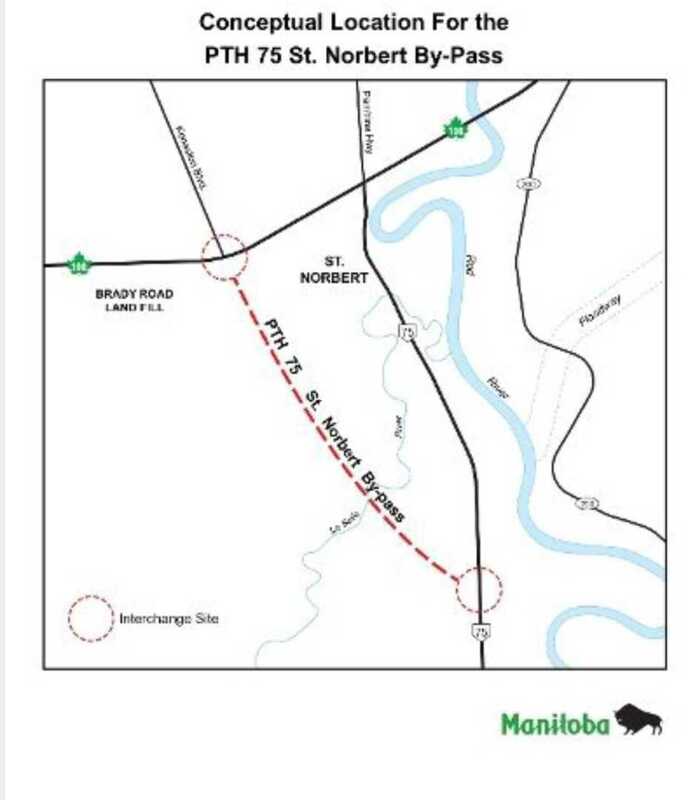 The Provincial St. Norbert By-Pass project will support Centerport Canada and trucking routes that move from the Perimeter Highway to PTH 75 and the U.S. border (click on map to increase size). “As our economy continues to grow, we will increase our investments in transportation infrastructure to ensure commercial and other traffic flows safely and smoothly through the capital region,” said Minister Ashton, Province of Manitoba. “This project will offer long-haul trucks, motorists and tourists the option of a high-speed link from the south Perimeter to PTH 75,” said Terry Shaw, executive director, Manitoba Trucking Association. 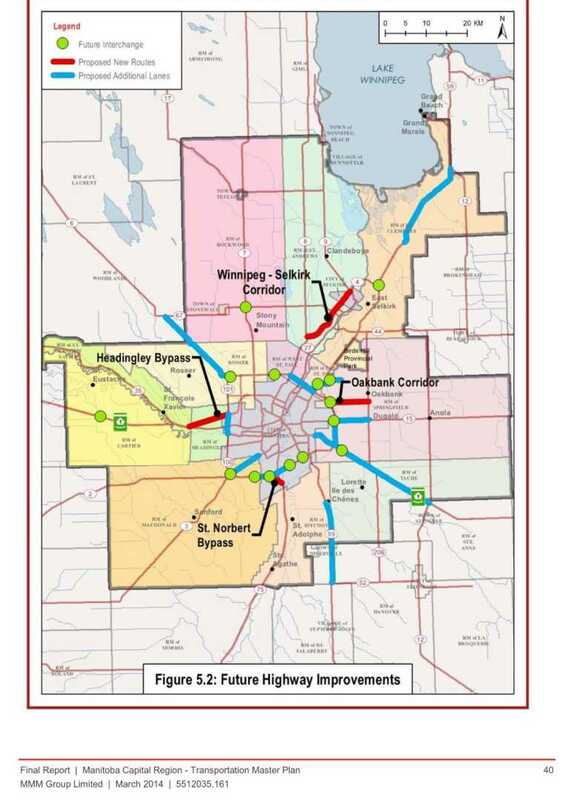 Kenaston Boulevard serves as a key linkage in the Province of Manitoba’s Capital Region Master Transportation Plan, enabling goods movement throughout the City of Winnipeg (click on map to increase size). As part of CentrePort Canada, the Waverley West Arterial roads are a key link in the Mid-Continent Trade Corridor Network, enabling road corridors to Canada to the United States and Mexico. CentrePort Canada is a major initiative for the governments of Manitoba and Canada – the development of an inland port that will be utilized for goods movement and processing will ultimately provide a high concentration of goods movement and commuter travel. Increasing demands in global trade and transportation efficiencies, as well as growth in major industrial employment sectors, will create a number of challenges to accommodate goods movement trips through and within Winnipeg. Winnipeg’s geographical location, positions it as a key intermodal and freight hub. It links road and rail corridors from the east and west to the Mid-Continent Trade Corridor which connects Canada, the United States and Mexico. The Mid-Continent Trade Corridor facilitates Manitoba’s trade requirements and investments within the NAFTA countries through the development and maintenance of efficient and safe transportation systems (Economic Development Winnipeg). And YES! 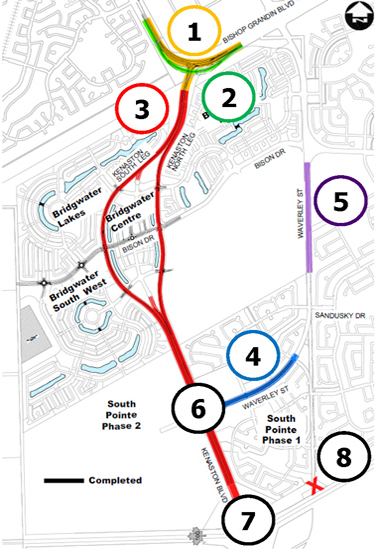 In addition to the 7 purposes above, the Waverley West Arterial roads also enable access to the communities of South Pointe and Neighbourhoods of Bridgwater. I anticipate receiving this funding breakdown in the next few days. So clearly, the Waverley Arterial project was built to serve multiple needs – and NOT built solely for the residents of Waverley West as is being stated and reported by various media sources.